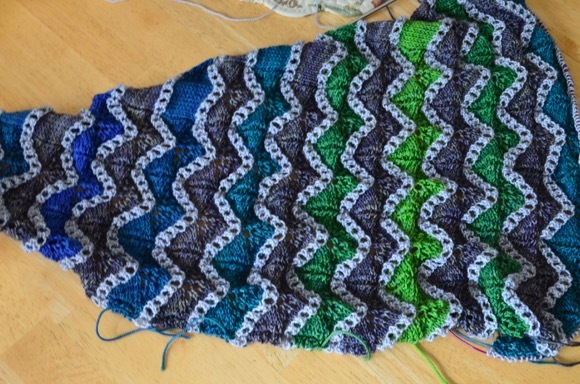 I'm enchanted with the true colors shawl. I find myself sitting down and knitting, getting lost in a sea of thoughts -- just one more row -- just one more color -- Everyone should have a knitting project that becomes an obsession! I will be sad when this knit is finished. 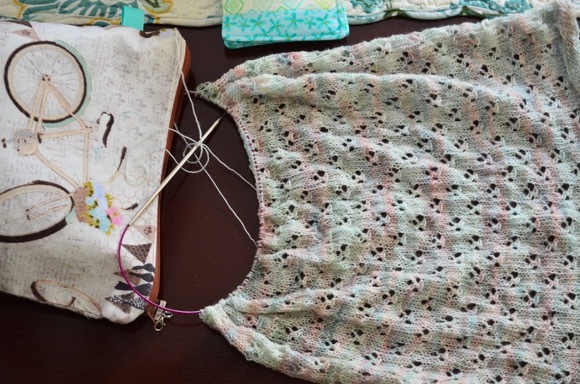 The clover leaf shawl is my pick up and go knitting project. The bag is tiny and portable and fits in my handbag. I have the pattern memorized and can quickly see where I am so I can knit away. I love having a lace knitting project in the summer months, light and airy in my lap. This one is a great knit that I'm enjoying. I'm currently reading The Chilbury Ladies' Choir and The Beautiful Mystery. Both are great reads! Both project look wonderful. The colors in your True Colors Shawl are amazing - so rich and perfect! Don't you just love Three Pines and Inspector Gamache? I do love that blue and green together. So, so pretty! clover leaf is a great mix of pattern and yarn lady!!! I love both of your current projects! I have The Chilbury Ladies Choir in my to-read cue and am glad to hear that you are enjoying it! Your first book I have on my TBR; its summary sounds like a good one. I really love your second shawl. I love the soft colors and how soft the yarn looks. I just want to bury my face in it and rub my cheek against it. You are not tardy in birthday wishes b/c technically, Jellybean's birthday is the 11th. Sometimes families take off early from school to travel overseas. I plan to make her her favorite gourmet mac 'n cheese Monday, a Barefoot Contessa recipe and I may make carrot cake. We'll see about that. Both knitting projects are beautiful. The shawl makes a perfect summer knit. That True Colors are beautiful. I can understand why you want to keep on knitting. I would love to make it but I find that I just don't use shawls. The stunning colours of the true colours shawl are a delight, just beautiful. Love both of your current knitting projects! I just started Before We Were Yours. 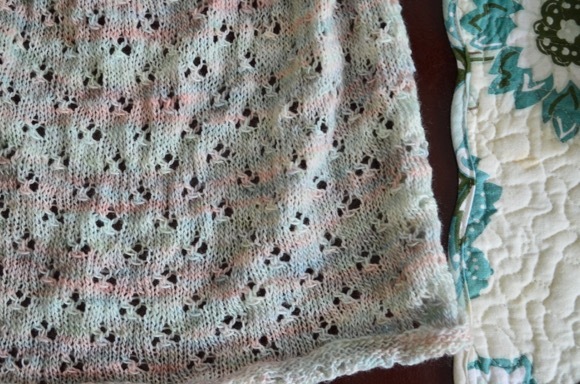 Both shawls are GORGEOUS! Is Cloverleaf one of your designs? Just beautiful!!! ~ Jill M.
Both projects are so pretty.